The Pittsburgh Penguins faced off against the new Jets Saturday, beating Winnipeg 4-1. Tonight they'll take on the old Jets as the Arizona Coyotes come to town. After a surprisingly strong start to the season, the Coyotes have faded as of late and sit comfortably outside the playoff picture in the Western Conference. It'll give the Penguins a chance to earn 2 points against a non-playoff contender and continue to gain ground in the playoff race. It's the second meeting between the teams on the year, and the Coyotes topped the Pens in the second game of the season by a 2-1 score. Oliver Ekman-Larsson might seem like he's been in the league for a decade, but that's largely because the 24-year-old Swede has played a high level offensively almost from the moment he entered the league and has blossomed into one of the elite defensemen in the game. He set a career high with 23 goals last season, and with 19 goals he's second in the league among defensemen and on pace to best his career high. 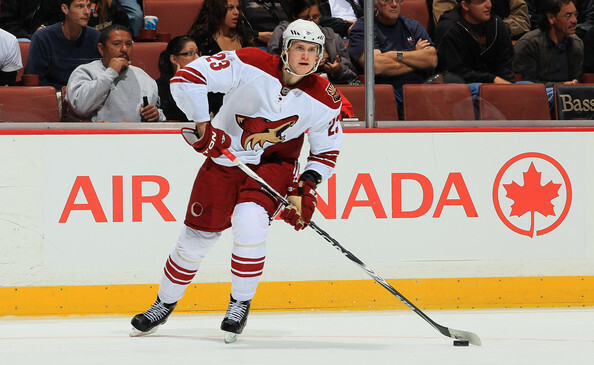 He's leading the Coyotes with 48 points, but it's another talented young player that is right behind him. Max Domi is second on Arizona with 42 points (17 goals, 25 assists) in his rookie season after being selected 12th overall by the Coyotes in 2013. Best known for being the son of Tie Domi, the younger Domi's game is nothing like that of his father. Max Domi has high end offensive potential and should be a fixture in the Arizona lineup for a long time to come. Speaking of fixtures, captain Shane Doan has spent each of his 20 seasons with the Arizona franchise. Doan is the last remaining active player to have suited up for the original Winnipeg Jets, and he's continuing to play effective hockey even at 39 years old, leading the team with 23 goals in 53 games played. With 935 career points, Doan is in position to potentially reach 1,000 points on his career, if he decided to continue his career into next season. But while the Coyotes are 10th in the league in scoring at 2.69 G/gm, they are second to last in preventing goals with 3.08 GA/gm. It's become clear that Mike Smith's in his first season with the Coyotes in 2011-12, during which he posted a 2.21 GAA and 0.930 SV%, was nothing more than a mirage, anad Smith has quickly come back down to Earth since then. Unfortunately for the Coyotes, the 6 year, $34 million contract extension they gave him in the 2012 offseason won't disappear as quickly or easily as Smith's success. He's played in only 22 games this season and was playing poorly before having surgery to fix a core muscle injury, posting a 3.06 GAA and a 0.901 SV%. Unfortunately for the Coyotes their other options have played poorly as well. Louis Domingue has the best numbers at the bunch in his second season, but allowing a 2.73 GAA with a 0.912 SV% isn't saying much. Anders Lindback also joins Smith on the injury list after suffering an Achilles injury, but Lindback has proven by now that he ins't an NHL caliber goaltender and is nothing more than an injury callup. - The Pens acquired Justin Schultz from the Edmonton Oilers shortly after the game on Saturday, but due to immigration issues he's unlikely to join the team before Wednesday or Thursday, according to General Manager Jim Rutherford. - It'll be a short trip for Sergei Plotnikov to report to his new team as the Pittsburgh Penguins traded him to the Arizona Coyotes earlier today ahead of the deadline. While Plotnikov hit the ice with his new team for the morning skate, and it's likely he'll be in the lineup tonight instead of spending one final game at Consol Energy Center watching from the press box.